Variations of this type of yoke are understandably popular. They are a great way to emphasize a slim midriff and small waist while retaining the shaping of the upper bodice. 1. On a bulging-block bodice, draw the yoke style line* and notch it (Fig. 73a). 2. Cut away the yoke. Open the remaining dart control on the bodice (Fig. 73b). This may be used as one dart, multiple darts, or gathers. * Whenever drawing a curved style line from the center-front or center-back posi¬tion, first square a short line (tAl inch) at the center line. This assures a smooth. continuous curve. Without doing-so you may discover a point or a dip at center when the material is opened out (Fig. 73c). When the yoke is cut away, note that part of the dart control :appears in the joining seam and part on the yoke side seam. The midriff section of this unfitted dress is bodice yoke plus skirt Joke. 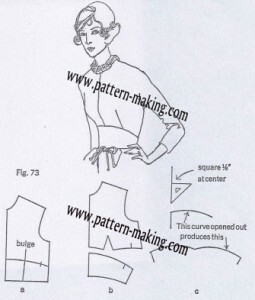 The basis for this design is the hip-length sloper (Fig. 74). 1. Trace the hip-length sloper (see page 119). Cut out the darts. Close the waistline bodice-skirt dart and fasten it with Scotch tape. (It’s easier to do this if you first slash the waistline. It can be closed at a later stage.) By doing this, you’ve created a partial bulging block-all that is necessary to produce the pattern for this design. 2. 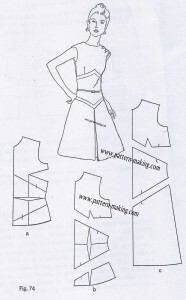 Draw the midriff yoke style lines on bodice and skirt. Notch the style lines (Fig. 7 4a) . 3. Cut away the midriff yoke. Shift the underarm dart to what’s left of the bodice waistline dart, thus enlarging it (Fig. 7 4b). slash. The midriff pattern should now lie flat (Fig. 74b). In this design this much midriff dart control is left as unstitched fullness. 5. Trace the bodice and midriff patterns. Close the skirt dart. 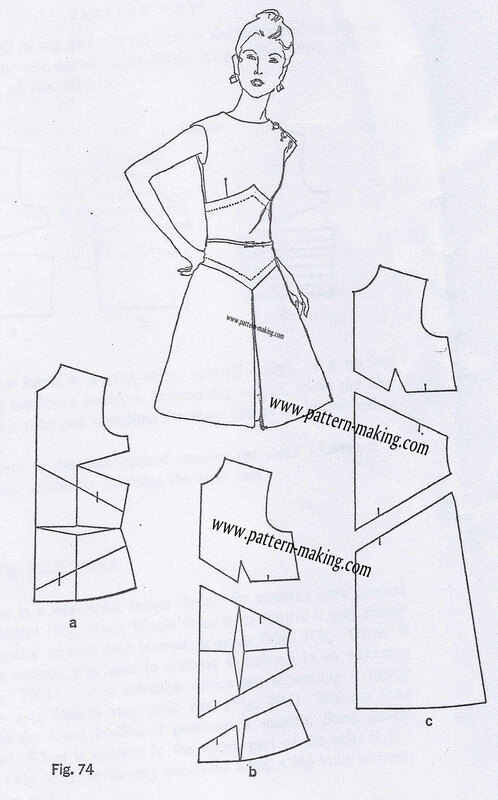 Ex¬tend the remainder of the skirt pattern to full length (Fig. 7 4c). Add flare by the method described on page 144.